Well, my very first travel- blog, in fact, has nothing to do with traveling, but with the Winter Music Conference, or as it is more commonly known among tranceaddicts – WMC. Thus, this is my WMC 2005 party report. Wednesday night, March 23, 2005. I came home from work at about 6 pm and couldn’t concentrate on anything, in anticipation of the upcoming trip. After “discovering” electronic dance music and attending multiple gigs at NYC’s famous Avalon, Crobar and Spirit, I finally grew “senior” enough to attend the world’s famous WMC in Miami. One of the prep-steps was to print a “Ik wil een Nederlands meisje zeij” t-shirt for Tiesto’s show. Who knew, at the time, that this shirt would help me meet my future boyfriend, Dimitri de Wit, a man whose friendship I will cherish forever. Before going to sleep, I packed my suitcase and called a car service to schedule a 5.00 am pick-up. Everything was ready for Miami, nevertheless, I could hardly sleep. By 5.15 am, I was already checking my bag at the JFK AA terminal; even a fact that I lost my phone on the way to the airport, didn’t spoil my mood. I was ready to leave snowy and rainy New York City. On a plane I sat next to Brian C. (one of the active tranceaddict.com members) and got to meet a bunch of other guys who were going to the Conference. Brian’s friends met us at the airport and we went straight to The Clay hotel, where we all had booked rooms. The Clay Hotel is, perhaps, Miami’s cheapest accommodation, with 3 types of rooms: hotel-like, shared bathroom rooms and hostel-like. The property is located in the heart of Art Deco area, close to all the restaurants, beach and clubs. I found the hotel to be a bit dodgy and in need of repair, but it was a total steal for the price I paid. I checked in to my room with no problems, changed clothes, because my jeans and leather jacket weren’t weather- appropriate for SoBe (around +75F). I put on my bathing suit and headed out with Arty V. to have a brunch at Jerry’s Deli, before attending a Wet Grooves Party at The Shelborne Hotel. By 2 pm, I was already in line, and after refusing to “surrender” my ticket to a drunk guy for $200, I got inside. The pool at Shelborne was full of beautiful people and rocking the trance beats. The moment we got in, Robbie Rivera started his set. Having never heard him spinning before, he quite impressed me with his style and made everybody got out of the pool and dance. Chris Lawrence, Paul Oakenfold, George Acosta and Darude succeeded each other till about 8.30 pm. For info, at that moment in life, I was under Darude’s spell. Just a week prior, I flew to Las Vegas to hear him spin and I couldn’t get enough of his beats. Ville rocked The Shelborne. 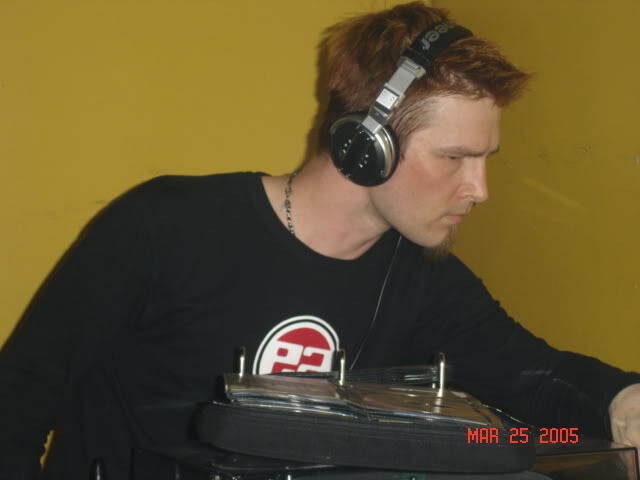 Unfortunately, videos I recorded that evening, didn’t make to my youtube.com site, as it contained tracks yet to be released on Darude’s new “Label This” CD. Then Rick (the Telemundo’s producer) fetched me a VIP pass, which allowed me to freely browse around the hotel premises. Hessu H. arrived and with some other people, we ended up hanging out in the backstage, dancing and discussing new music trends. To my surprise, some of the tranceaddics (Candy Girl and Mattivi) recognized me and came to say “hello”. After the Wet Grooves Party, Hessu, Marko, Turo (my Finnish friends) and I went to Wyndham hotel to relax before going out to Lounge 16 to attend Darude’s second gig at WMC. It was such an intimate venue, but everyone who showed up were truly fans of Da Man! Around 3 am I dropped Darude and Hessu by their hotel in Downtown Miami (they were leaving for Puerto Rico the next day) and went to Space to catch the last minutes of Tiesto‘s gig. Line outside of Space was so unreasonably long that, despite my acquaintance with Tijs and love for his music, it was not worth standing. After running into Pete Kalamoutsos and catching up on the latest WMC gossips, I optioned to go back to the hotel. Arty V, Ben and I started a day with a lunch and then drove to Nikki Beach. It is one of my favorite places in Miami, because it never disappoints – music, vibe, ambiance and crowd are all top notch. We got there at about 2 pm and the place was already grooving. Music was great, crowd was even better. I got my beach chair and fell asleep (simply due to lack of sleep the night before). The sound of Behrouz woke me up. Rarely had I heard a set that would make everybody get up and dance their butts off. By 7 pm, the party started to die out, people were chilling, drinking but music became boring and redundant. We decided to leave, in order to pick up our ticket for Paul van Dyk at Space on the same evening. We ended the day by devouring delicious meal at some Vietnamese restaurant in SoBe. I got to Space for PvD at 1 am. After waiting in line for about 2 hours, I ran out of patience and left. Ironically, I purchased my two Space tickets far in advance, but failed to get in both nights. Sadly, I missed the best shows of the WMC 2005, but learned my lesson to arrive early next time. In the morning I went to the beach, where I met a nice guy from Tampa Bay. Of all topics to talk about, we ended up discussing a war in Iraq and American politics. Jacob was only 21 y.o., but amazingly clever and opinionated. He introduced me to his mom who left me her telephone number in case I needed something. It was sweet of her. I got back to the hotel at about 3 pm to get myself ready for Ultra. Even though, Ultra Music Festival started around noon, for the best line-up, it is recommended to show up after 5 pm. I had difficulties getting a cab, so after 45 minutes of waiting, I accepted an offer from a random Italian guy who volunteered to drive me “wherever I was going to”. I arrived to Ultra at about 4 pm, a line was endless but flawless organization of the event, got me in within 10 minutes. Ultra Festival is a “non-camera” venue and of course, the brief purse search revealed my camera. But… believe it or not, I addressed to a police officer, who was standing behind the ticket guy, and told him that there was no way I would go back to the hotel without attending at least one WMC event. Surprisingly, he let me in under the condition that I won’t take any pictures or videos….so naive of him! I headed straight for the main stage. It was about 4.30 pm and Ferry Corsten just started his set. Do I really need to tell you how much I love this guy? I guess not. As soon as I saw Ferry, I got my “dutch” shirt out and showed it to him (I was standing in the first row, facing the DJ booth). The venue wasn’t packed yet, so he saw me and started laughing. Then Oakey (Paul Oakenfold) came in. He had an impressive laser and visual affects. Admittedly, his set was much better than the one I have heard at The Shelborne a few days earlier. Junkie XL came next. I could see why people were excited to hear him spin because he definitely had a connection with the crowd but his music wasn’t my cup of tea. I thought his set wasn’t align with the music trajectory that was developing that evening at the Main Stage. Who said Tiesto was coming? TI-ES-TO, TI-ES-TO. I bet everyone came to see him, otherwise I can’t explain why the entire audience immediately turned orange 😉 The #1 was right on time -jumped on the stage and rocked the amphitheater. He was back! The energy, the sounds, the charisma shone through to all his fans (and I am a devoted one). He played some tunes from his last set at Crobar but, thank God, the old Tiesto was back. Some progressive in the beginning and then… Just be…and of course every single person was singing “Love comes again” together with Tijs. I can’t say that Tijs was too much into his set (but definitely into his cameraman), nevertheless, he was enjoying himself and all 40,000 people were going nuts. After second track Dimitri (Tijs’ manager) spotted me in the crowd. My shirt attracted his attention so, he called Wilfried and pointed at me. When all their attention was on me, I turned around to show them the rest of the “message” but they couldn’t see it, so I simply took my shirt off….. and raised it above my head. The back of it read “Wil je met me trouwen?”. Dimitri and Wilfried burst out laughing. This simple gesture brought Dimitri and I together forever, but I didn’t know that at the moment. When I knew that Tiesto was about to finish his set, I asked a guy next to me to lift me up, so I could reach the pre-stage area. Security was scanning the room and I had all the chances to be kicked out of Ultra. I knew Tiesto was expecting to see me there, so I got on top of the fence and turned my face to him. He looked at me and gave me his killing smile. My mission was completed but apparently, the Ultra’s producers decided to record my moment of fame, because instantaneously all the cameras were focused on me. I felt like a little girl under the stage projectors, but I didn’t care and kept on dancing. Thanks to Dimitri, later, I found out it was he, who ordered security to leave me alone and let me enjoy the last beats of “Adagio for Strings“. PvD succeeded Tijs on the stage. He did a pretty good job, but I can’t tell what i was enjoying more – his set or Ricky Martin and NU -NRG guys dancing in the back stage. I didn’t know Ricky was a friend of Paul??!! Ultra ended at 12 am, everyone was rushing out to the AAA for the after-party. I wasn’t going there because I was not a big fan of Sasha. I got held up by the stage, because people kept coming and asking me to take a picture with them. Funny feeling. Amphitheater was nearly empty and I was still inside, talking to some Dutch guys, when one of the crane cameras approached us. It was hanging right in front of our faces with its red eye on. As if planned, we all started jumping and shouting. What do you think we were screaming? “TIESTO #1! TIESTO #1!” Do you think I’m gonna be on Ultra’s DVD? You bet! After the show we went to check out Space and obviously, it was packed again. In the morning, we went to the beach, but it was too windy, so we moved to the hotel’s pool. Apparently, somebody told us that Armin van Buuren was scheduled to play at Nikki Beach. It turned out to be a lie, as we found out when we turned up at the venue later. Many people have left Miami, because the WMC came to an end, that is why Nikki beach was almost empty. We stayed there for next… 10 hours, dancing with Marques Wyatt and enjoying our last day in Miami. I left at about 11 pm, but not before running into some NYC TA guys. I walked all the way to the hotel, buying ice creams at every store that was still open. Naturally, I was still to complete my shopping list, so I stopped by a few gift shops on my way. At one of the T-shirt stores, I tried on no less than 15 t-shirts which forced the manager (or owner) to offer me a t-shirt modeling job. 5.00 am is my wake-up call. I arrived at the Miami International Airport at 6.30 am, checked my bag, got breakfast, boarded a plane and two hours later I was back to rainy NYC. Bear with me, I’m almost done. Summary – I didn’t see everything, but I didn’t plan to see everything and everybody. Pity, I didn’t manage to get in to Space but…. I’ll be back and all the DJs will be back too. This entry was posted in United States of America and tagged AmericanAirlines, ChristopherLawrence, DallasSuperstars, Darude, DJs, FerryCorsten, GeorgeAcosta, JunkieXL, JustBe, LoveComesAgain, MarquesWyatt, Miami, Party, PaulOakenfold, RobbieRivera, TheClayHotel, tranceaddict, Ultra, Winter Music Conference, WMC. Bookmark the permalink.